In the CAGED system, do the shapes ALWAYS match up to ANY and ALL scale shapes in that area? I was watching your youtube video again, and the second part at the end you reference the Eb mixelodeon (sp? ), and how the d shape and a shape fit into it. 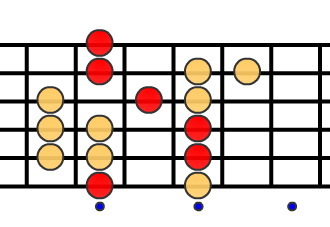 but do these CAGED shapes fit into all scales? The CAGED shapes can serve as the basis for most scales. 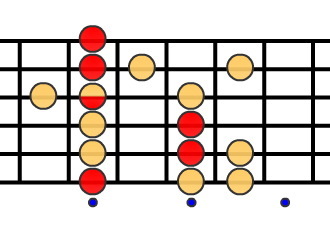 Certainly the Major, Mixolydian, and Lydian scales fit well. Also any major based arpeggio works. When you get into minor and more altered scales, you can still use the CAGED shapes, but some of the notes will need to be adjusted. The 3rd of the scale won’t match the note used in the CAGED pattern. If you use the Super Scale Trainer to view minor scales in reference mode with the CAGED display turned on you’ll see what I mean. The CAGED shapes still make a great starting point, but a little extra work is required. Start with the “E” Shape at the 5th position. This gives you an “A” major chord. 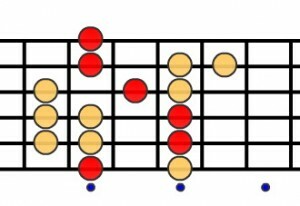 Most of the strings include the original CAGED note (shown in red). 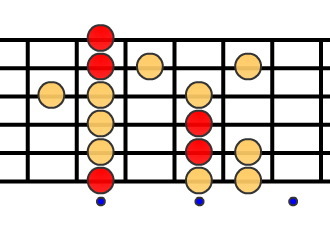 However the third string does not, because that CAGED note is not in the minor scale. But, since the CAGED shape is providing a note on 5 out of 6 strings it still makes a good starting point for building the scale. A minor scale using "minor shape"
The concept is the same: Use a first position chord as the skeleton for scales and arpeggios. The only difference is you use a minor chord instead of a major. Try it out! If you are new to the CAGED system watch our introduction to the CAGED system. 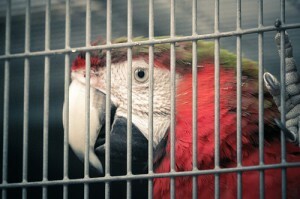 This entry was posted on Saturday, April 30th, 2011 at 7:09 am	and is filed under CAGED. You can follow any responses to this entry through the RSS 2.0 feed. You can leave a response, or trackback from your own site. Love the idea of your guitar games software. I wanted find out if there was anything available for the ipad? Tried using the website but does not seem to agree with the ipad. Fret Tester: teaches notes on the guitar, bass, and mandolin. Music Theory Calculator: gives notes an audio for tons of scales and chords. All available at the app store. The one’s on the site don’t work on iPad because they are written in Flash. Thanks!